United States Mint American Silver Eagle bullion coins made history last week as the all-time annual sales record shifted to 2011 when buyers scooped up more of the coins this year than in any other since the series kicked-off in 1986. The previous annual record was set in 2010 when sales finished at 34,662,500. 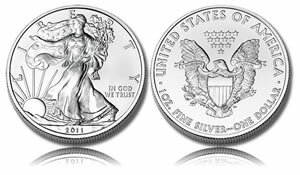 At the end of September 2011, American Silver Eagle year-to-date sales stood at 33,411,500, or 96.4 percent of the old ceiling. Then, the 2010 annual sales record was officially surpassed on Thursday, October 6, when orders moved to 34,673,500. The number continues to climb, with the bullion coins topping the 35 million milestone the very next day. 2011 overtook the previous annual sales record almost one month earlier than when 2010 surpassed the record set in 2009. Investor demand for the .999 fine silver coins continues to sell at unprecedented levels. Numbers have been thrown out for the final annual sales figure which will be cemented on December 31. Monthly sales this year have been averaging around 3.7 million. If the final three months maintain that sales pace, which is very likely since November and December are traditionally among the strongest months of the year for gold and silver bullion coins, then 2011 could easily end with sales of more than 44 million. Below is a list of this year’s extraordinary monthly sales. January 2011 currently holds the all-time highest monthly record, and September is holding the second best all-time monthly slot. *Tuesday, October 11 is the "as of date" for the bullion eagle numbers. This year’s bullion coins have several competitors… of sorts. The first one is the 2011-W Proof American Silver Eagle, which debuted on June 30, and the second is the 2011-W Uncirculated American Silver Eagle, which launched on September 15. Both are intended for collectors. These collector issues have been very popular this year as well, with orders winding up at 755,777 for the proofs and 182,100 for the uncirculated coins, as of October 10. Additionally, the United States Mint in August announced that it would offer a special American Eagle 25th Anniversary Silver Five-Coin Set before the year ends. Containing one of the bullion coins and the two already described collector coins, the set would also feature a 2011-S Uncirculated American Silver Eagle as well as a unique West Point minted "reverse proof" version. Investment-grade competitors include the America the Beautiful Five Ounce Silver Bullion Coins, also struck in .999 fine silver. As of October 10, the United States Mint has sold 388,600 of the 2011-dated bullion coins to its network of Authorized Purchasers. Like their circulating quarter-dollar counterparts, these coins feature designs that honor Gettysburg National Military Park, Glacier National Park, Olympic National Park, Vicksburg National Military Park, and Chickasaw National Recreational Area.